DISCOURSE 2 ON THE IMMACULATE CONCEPTION: Fr. Reginald Garrigou-LaGrange, O.P. The feast of the Blessed Virgin's Immaculate Conception is the most solemn of all those which the Church celebrates during the holy time of Advent; and if the first part of the cycle had to offer us the commemoration of some one of the mysteries of Mary, there was none whose object could better harmonize with the spirit of the Church in this mystic season of expectation. Let us, then, celebrate this solemnity with joy; for the Conception of Mary tells us that the Birth of Jesus is not far oft. The intention of the Church, in this feast, is not only to celebrate the anniversary of the happy moment in which began, in the womb of the pious Anne, the life of the ever-glorious Virgin Mary; but also to honor the sublime privilege, by which Mary was preserved from the original stain, which, by a sovereign and universal decree, is contracted by all the children of Adam the very moment they are conceived in their mother's womb. The faith of the Catholic Church on the subject of the Conception of Mary is this: that at the very instant when God united the soul of Mary, which He had created, to the body which it was to animate, this ever-blessed soul did not only not contract the stain, which at that same instant defiles every human soul, but was filled with an immeasurable grace which rendered her, from that moment, the mirror of the sanctity of God Himself, as far as this is possible to a creature. The Church with her infallible authority, declared, by the lips of Pius IX, that this article of her faith had been revealed by God Himself. The Definition was received with enthusiasm by the whole of Christendom, and the eighth of December of the year 1854 was thus made one of the most memorable days of the Church's history. It was due to His own infinite sanctity that God should suspend, in this instance, the law which His Divine justice had passed upon all the children of Adam. The relations which Mary was to bear to the Divinity, could not be reconciled with her undergoing the humiliation of this punishment. She was not only daughter of the eternal Father; she was destined also to become the very Mother of the Son, and the veritable bride of the Holy Ghost. Nothing defiled could be permitted to enter, even for an instant of time, into the creature that was thus predestined to contract such close relations with the adorable Trinity; not a speck could be permitted to tarnish in Mary that perfect purity which the infinitely holy God requires even in those who are one day to be admitted to enjoy the sight of His Divine majesty in Heaven; in a word, as the great Doctor St. Anselm says, "it was just that this holy Virgin should be adorned with the greatest purity which can be conceived after that of God Himself, since God the Father was to give to her, as her Child, that only-begotten Son, whom He loved as Himself, as being begotten to Him from His own bosom; and this in such a manner, that the selfsame Son of God was, by nature, the Son of both God the Father and this blessed Virgin. This same Son chose her to be substantially His Mother; and the Holy Ghost willed that in her womb He would operate the conception and birth of Him from whom He Himself proceeded." Moreover, the close ties which were to unite the Son of God with Mary, and which would elicit from Him the tenderest love and the most filial reverence for her, had been present to the Divine thought from all eternity: and the conclusion forces itself upon us that therefore the Divine Word had for this His future Mother a love infinitely greater than that which He bore to all His other creatures. Mary's honor was infinitely dear to Him, because she was to be His Mother, chosen to be so by His eternal and merciful decrees. The Son's love protected the Mother. She, indeed, in her sublime humility, willingly submitted to whatever the rest of God's creatures had brought on themselves, and obeyed every tittle of those laws which were never meant for her: but that humiliating barrier, which confronts every child of Adam at the first moment of his existence, and keeps him from light and grace until he shall have been regenerated by a new birth-----oh! this could not be permitted to stand in Mary's way, her Son forbade it. The eternal Father would not do less for the second Eve than He had done for the first, who was created, as was also the first Adam, in the state of original justice, which she afterwards forfeited by Sin. The Son of God would not permit that the woman, from whom He was to take the nature of Man, should be deprived of that gift which He had given even to her who was the mother of sin. The Holy Ghost, who was to overshadow Mary and produce Jesus within her by His Divine operation, would not permit that foul stain, in which we alone are aIl conceived, to rest, even for an instant, on this His Bride. All men were to contract the sin of Adam; the sentence was universal; but God's Own Mother is not included. God who is the author of that law, God who was free to make it as He willed, had power to exclude from it her whom He had predestined to be His own in so many ways; He could exempt her, and it was just that He should exempt her; therefore, He did it. Thus was salvation promised the human race under the form of a victory over Satan; and this victory is to be gained by the Woman, and she will gain it for us also. Even granting, as some read this text, that it is the Son of the Woman that is alone to gain this victory, the enmity between the Woman and the serpent is clearly expressed, and she, the Woman, with her own foot, is to crush the head of the hated serpent. The second Eve is to be worthy of the second Adam, conquering and not to be conquered. The human race is one day to be avenged not only by God, made Man, but also by the Woman miraculously exempted from every stain of sin, in whom the primeval creation, which was in justice and holiness, will thus reappear, just as though the Original Sin had never been committed. Raise up your heads, then, ye children of Adam, and shake off your chains ! This day the humiliation which weighed you down is annihilated. Behold! Mary, who is of the same flesh and blood as yourselves, has seen the torrent of sin, which swept along all the generations of mankind, flow back at her presence and not touch her: the infernal dragon has turned away his head, not daring to breathe his venom upon her; the dignity of your origin is given to her in all its primitive grandeur. This happy day, then, on which the original purity of your race is renewed, must be a feast to you. The second Eve is created; and from her own blood [which, with the exception of the element of sin, is the same as that which makes you to be the children of Adam], she is shortly to give you the God-Man, who proceeds from her according to the flesh, as lIe proceeds from the Father according to the eternal generation. And how can we do less than admire and love the incomparable purity of Mary in her Immaculate Conception, when we hear even God, Who thus prepared her to become His Mother, saying to her, in the Divine Canticle, these words of complacent love: 'Thou art all fair, O my love, and there is not a spot in thee!' It is the God of all holiness that here speaks; that eye, which sees all things, finds not a vestige, not a shadow of sin; therefore does He delight in her, and admire in her that gift of His own condescending munificence. We cannot be surprised after this, that Gabriel, when he came down from Heaven to announce the Incarnation to her, should be full of admiration at the sight of that purity, whose beginning was so glorious and whose progress was immeasurable; and that this blessed spirit should bow down profoundly before this young Maid of Nazareth, and salute her with 'Hail, O full of grace!' And who is this Gabriel? An Archangel, that lives amidst the grandest magnificences of God's creation, amidst all the gorgeous riches of Heaven; who is brother to the Cherubim and Seraphim, to the Thrones and Dominations; whose eye is accustomed to gaze on those nine angelic choirs with their dazzling brightness of countless degrees of light and grace; he has found on earth, in a creature of a nature below that of Angels, the fulness of grace, of that grace which had been given to the Angels measuredly. This fulness of grace was in Mary from the very first instant of her existence. She is the future Mother of God, and she was ever holy, ever pure, ever Immaculate. The Symbol of our faith has therefore received not a new truth, but a new light on a truth which was previously the object of the universal belief. On that great day of the definition, the infernal serpent was again crushed beneath the victorious foot of the Virgin-Mother, and the Lord graciously gave us the strongest pledge of His mercy. He still loves this guilty earth, since He has deigned to enlighten it with one of the brightest rays of His Mother's glory. How this earth of ours exulted! The present generation will never forget the enthusiasm with which the entire universe received the tidings of the definition. It was an event of mysterious importance which thus marked this second half of our century ; and we shall look forward to the future with renewed confidence; for if the Holy Ghost bids us tremble for the days when truths are diminished among the children of men, He would, consequently, have us look on those times as blessed by God in which we receive an increase of truth; an increase both in light and authority. The Church, even before the solemn proclamation of the grand dogma, kept the feast of this eighth day of December; which was, in reality, a profession of her faith. It is true that the feast was not called the Immaculate Conception, but simply the Conception of Mary. But the fact of such a feast being instituted and kept, was an unmistakable expression of the faith of Christendom in that truth. St. Bernard and the angelical doctor, St. Thomas, both teach that the Church cannot celebrate the feast of what is not holy; the Conception of Mary, therefore, was holy and immaculate, since the Church has, for ages past, honored it with a special feast. The Nativity of the same holy Virgin is kept as a solemnity in the Church, because Mary was born full of grace; therefore, had the first moment of Mary's existence been one of sin, as is that of all the other children of Adam, it never could have been made the subject of the reverence of the Church. Now, there are few feasts so generally and so firmly established in the Church as this which we are keeping today. 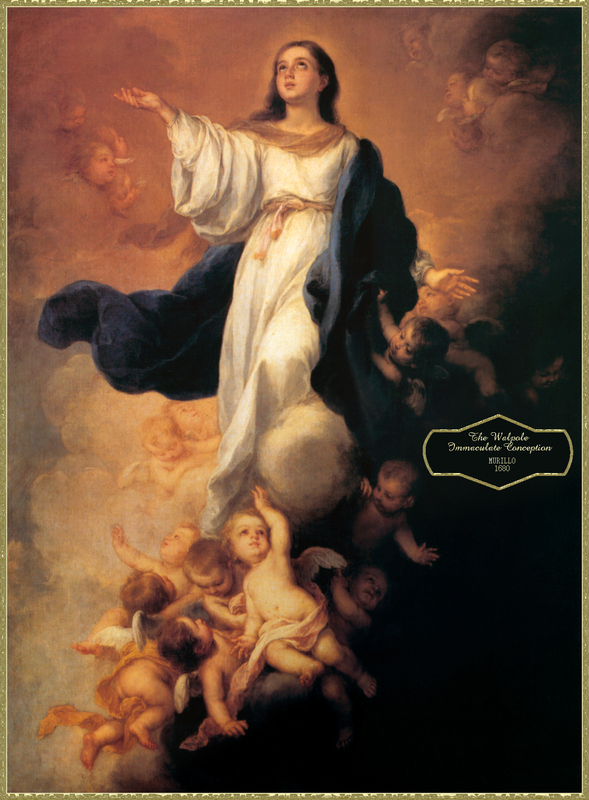 In 1847 the Bishops of the United States requested permission from the Holy Father, Pope Pius IX, to declare the Blessed Virgin Mary as patroness of the United States under the title of "The Immaculate Conception." This title reflects Mary's privilege of being free from Original Sin. The Marian Teachings of Fr. Maximilian Kolbe, Fr. H.M. Manteau-Bonamy, O.P. A few hours before his second and final arrest, on February 17, 1941, Fr. Kolbe had time to put on paper his thoughts about her, who for a quarter of a century, day after day, had never ceased to occupy his priestly and apostolic mind and heart. This text, is therefore, of the highest importance. He could not have written it during his captivity at Pawiak near Warsaw, nor during his detention in the death camp at Auschwitz, even though he delivered many spiritual sermons on the Immaculata. In these lines we find the gist of his Marian doctrine ---- based on several sketches of text from a projected book of his, dating back mostly to the years 1939--41. IMMACULATE CONCEPTION. These words fell from the lips of the Immaculata herself. Hence, they must tells us in the most precise and essential manner who she really is. Since human words are incapable of expressing Divine realities it follows that these words: "Immaculate," and "Conception" must be understood in a much more profound, much more beautiful and sublime meaning than usual: a meaning beyond that which human reason at its most penetrating, commonly gives to them . . . However, we can and should reverently inquire into the mystery of the Immaculata and try to express it words provided by our intelligence using its own proper powers. Humans do not exist before their conception, so we might call them created "conceptions." But you, O Mary, are different from all other children of Eve. They are conceptions stained by Original Sin; whereas you are the unique, Immaculate Conception. It is true that the words we use to speak of created realities express the Divine perfections only in a halting, limited and analogical manner. They are only a more or less distant echo----as are the created realities that they signify ---- of the properties of God himself. Would not "conception" be an exception to this rule? No, there is never any such exception. The Father begets the Son; the Son proceeds from the Father and the Son. Theses few words sum up the mystery of the life of the Most Blessed trinity and of all the perfections in creatures which are nothing else but echoes, a hymn of praise of this primary and most wondrous of all mysteries. We must perforce use our vocabulary, since it is all we have; but we must never forget that our vocabulary is very inadequate. Who is the Father? What is His personal life like? It consists in begetting, eternally because He begets His Son from the beginning and forever. Who is the Son? He is the Begotten-One, because from the beginning and for all eternity He is begotten by the Father. And Who is the Holy Spirit? The flowering of the love of the Father and the Son. If the fruit of created is a created conception, then the fruit of Divine love, that prototype of all created love, is necessarily a Divine "conception." The Holy Spirit is, therefore, the "uncreated, eternal conception," the prototype of all the conceptions that multiply life throughout the whole universe. The Father begets; the Son is begotten; the Spirit is the "conception" that springs from their love; there we have the intimate life of the Three Persons by which They can be distinguished from one another. But They are united in the Oneness of Their Nature, of Their Divine existence. The Spirit is, then, this thrice holy "conception," this infinitely holy Immaculate Conception . . .
And in what does this life of the Spirit in Mary consist? He Himself is uncreated Love in her; the Love of the Father and of the Son, the Love by which God loves Himself, the very love of the Most Holy Trinity. he is a fruitful Love, a "Conception." Among creatures made in God's image, the union brought about by married love is the most intimate of all. In a much more precise, more interior, more essential manner, the Holy Spirit lives in the soul of the Immaculata, in the depths of her very being. He makes her fruitful, from the very first instance of her existence, all during her life, and for all eternity. This eternal "Immaculate Conception" [which is the Holy Spirit] produces in an immaculate manner Divine life itself in the womb or depths of Mary's soul, making her the Immaculate Conception, the human Immaculate Conception. And the virginal womb of Mary's body is kept sacred for Him; there He conceives in time the human life of the Man-God. And so the return to God [which is love], that is to say the equal and contrary reaction, follows a different path from that found in creation. The path of creation goes from the Father through the Son and by the Holy Spirit; this return trail goes from the Spirit through the Son back to the Father; in other words, by the Spirit the Son becomes incarnate in the womb of the Immaculata; and through this Son love returns to the Father. And she the Immaculata, grafted into the Love of the Blessed trinity, becomes from the first moment of her existence and forever after the "complement of the Blessed Trinity." In the Holy Spirit's union with Mary we observe more than the love of two beings; in there is is all the love of the Blessed trinity; in the other, all of creation's love. So it is that in this union Heaven and earth are joined; all of Heaven with the earth, the totality of eternal love with the totality of created love. It is truly the summit of love. At Lourdes, she did not say that she was conceived immaculately, but as St. Bernadette repeated it, "Que soy era immaculata councepiou:" "I am the Immaculate Conception." Our Heavenly Father is the source of all that is; everything comes from the Blessed Trinity. We cannot see God, and so Jesus came to this earth, to Him known to us. The Most Blessed Virgin is the one in whom we venerate the Holy Spirit, for she is His spouse. The Third Person of the Blessed trinity never took flesh; still, our human word "spouse" is far too weak to express the reality of the relationship between the Immaculata and the Holy Spirit. We can affirm that she is, in a certain sense, the "incarnation" of the Holy Spirit. It is the Holy Spirit that we love in her; and through her we love the Son . . .